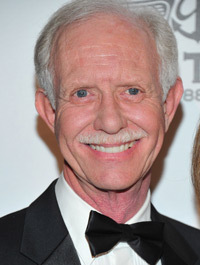 Captain "Sully" Sullenberger responsible for "Miracle on The Hudson" shares an excerpt from his new book "Making a Difference: Stories of Vision and Courage from America's Leaders." Thad Allen, U.S. Coast Guard commandant, was among the millions of television viewers who watched in horror as Hurricane Katrina ravaged coastal areas of Louisiana and Mississippi as well as the city of New Orleans in September 2005. The three-star admiral saw news reports of floating bodies, flooded homes, despondent families, and lawlessness gripping the city, and his mortification turned to anger. He asked other senior Coast Guard officers, "Why isn't somebody down there being the face of the federal government, standing in front of the Superdome, talking to CNN?" The next thing he knew, Admiral Allen was in New Orleans, serving in just that role, one for which this son of a Coast Guard chief damage control man was very well suited. Looking back, Allen, now retired from the Coast Guard, remembers the depressing and confused scene in Washington just prior to his deployment to New Orleans: "I was at the Pentagon, and they were talking about invoking the Insurrection Act and sending the troops in," he says. "There was this huge amount of frustration." Michael D. Brown. That assignment put him in charge of the Hurricane Katrina search and rescue and recovery efforts in the Gulf. His orders: "Just get to New Orleans and figure out what's going on. Stabilize the situation." A realist, the Coast Guard admiral told his wife, "'There's no guarantee this is going to be a success. In fact, there's every reason to believe this will be a miserable failure and nothing can be done at this point.' My wife reminded me that for the last thirty-something years, I've told everybody that my favorite definition of leadership is the ability to reconcile opportunity and competency. So it's kind of like: If not now, when? If not you, who? "'Okay,' I said. 'I'll go.'" While many in the federal government were castigated for the slow response to Hurricane Katrina's destruction, Thad Allen garnered almost universal praise for his leadership in response and recovery efforts along the Gulf Coast. He received similar praise for his command performance during the Deepwater Horizon oil spill in 2010. In fact, Admiral Allen has served in leadership roles during some of the country's most recent challenging times. He also commanded the Coast Guard's Atlantic forces in response to the terrorist attacks on September 11, 2001, when every U.S. port was considered a target. Known to his men as "the Schwarzkopf of Connecticut," Allen worked wonders inside his organization, too. He led the massive effort to update the service's antiquated command and logistics organizations, another major achievement of his thirty-nine-year Coast Guard career. I met Admiral Allen in Pentagon City, Virginia, at the offices of the RAND Corporation, where he is a senior fellow. Allen is a large, powerfully built sixty-two-year-old with a neatly trimmed mustache flecked with gray. His ruddy cheeks and well-weathered face mark him as a man who has spent much of his adult life on the sea. Allen was casually dressed for our meeting in a striped rugby pullover over a crisp white dress shirt. The former college football star gave me a very firm handshake. Allen still carries himself with a middle linebacker's barrel-chested confidence. He speaks in a gravelly voice, and his pale gray eyes are warm and curious. When you consider the intensity of his experiences and the success he has had in leading rescue and recovery efforts in the most extreme situations, it is no surprise that Allen exudes a high level of self-confidence, but it clearly comes from his strong values, determination, and inner strength. He is also a leader who carefully picks his team and then gives them his complete trust. "When I said yes, I'd go to New Orleans, the next thought was 'Okay, we can do that, but how?'" he recalled. "On my way to the airport, I called five people that I knew, to build a cadre around me in New Orleans. And I told them all the same thing. When they answered the phone I said, 'Find me in New Orleans in twenty-four hours.' That's all I told them. And of course it was almost impossible to get to New Orleans at that point." Allen flew to Baton Rouge later on the day of his appointment to FEMA. Arriving after dark, he was told that he couldn't get a helicopter to New Orleans until the next morning because of ongoing rescue operations. "First thing in the morning, I met with the folks from Louisiana, and it was clear that there was not a lot of understanding of what was going on or the magnitude of the situation," he said. Allen was mortified after his initial aerial view of the devastation. "As I flew in over New Orleans, I saw it was clearly filled with black water and there were still helicopters buzzing around. This is a week after the hurricane hit. I realized that at the national level, we had gotten this wrong in terms of the problem. We thought that we were dealing with a hurricane, and had it just been a hurricane, that probably would have been okay, but then Ground Zero would have been Bay Saint Louis in Waveland, Mississippi, which is where the eye came ashore." Admiral Allen, who currently teaches a course in leadership at George Washington University, told me that, in a moment of crisis, he often returns to the writings of Peter Senge, a scientist and lecturer at MIT's Sloan School of Management, who wrote of the importance of grasping the unique aspects of each challenge rather than relying on preconceived "mental models" based on ingrained assumptions, generalizations, or past experience. For Allen, in those chaotic hours of September 2005, Senge's concept of viewing a situation with a fresh eye was crucial to comprehending the scope of the Hurricane Katrina catastrophe. "It allows you to create a framework to make decisions, even if it's one that you kind of makeup yourself: 'I see this, and so I think this is what's going on,' " Allen told me. The aftermath of Hurricane Katrina was much more widespread and devastating than his superiors had initially grasped, and the response was disorganized, undisciplined, and sorely lacking in resources. "I realized as I flew into the city that I wasn't dealing with a hurricane. I was dealing with a weapon of mass effect that had been used on the City of New Orleans without criminality," he said. "And that became my mental model, my way to orient myself. It allowed me to explain a bunch of things. They had lost continuity of government in the City of New Orleans without decapitation. Usually when you lose continuity of government, you lose your leadership. They hadn't lost their leadership. They had a mayor and a governor, but forces had been flowing into that city for over a week. Those who'd come to help weren't working for anybody; they were self-deployed." The Coast Guard would save thirty-three thousand people and earn a presidential citation for its efforts, but at that point, a week after the hurricane hit, there was no "scripted, coordinated, or controlled" response from the myriad rescue forces that had descended upon the region. Admiral Allen quickly formed a plan of attack with another much-acclaimed leader of the response, U.S. Army Lieutenant General Russell L. Honoré, "the Ragin' Cajun" who commanded Joint Task Force Katrina. "We came up with a way to divide the city into sectors, then take his forces with rubber boats and high-water vehicles, and basically, we decided to go through the city and touch every house," Allen said. "We called it a 'Hasty Sweep.' . . . We provided the capability, capacity, and command and control the [rescue and recovery forces] didn't have, to allow them to be effective. That was the solution, ultimately, that worked in New Orleans." Allen took command of all search and rescue operations, reporting directly to U.S. Homeland Security Secretary Michael Chertoff, who reported to President George W. Bush, because "That's about the only way you could do that and then make it happen quick enough." By the end of the week, the White House team recognized that Allen was the man everyone looked to as the leader along the Gulf Coast, so they made it official. He was named to replace FEMA's much-criticized Mike Brown as head of the entire federal response. Once Allen had taken command, he was concerned that widespread criticism of the federal government's initial slow and disorganized response was damaging morale among those in the trenches who were scrambling to do better. 'Sir, there are four thousand people in this building.' I said, 'Find the biggest place you can and get as many people as you can there.' Turns out there was a big, open area down on the first floor and we got about twenty-five hundred people in it," Allen said. "I went down, and there was a sea of humanity." He noted that one of the similarities between the hurricane and the later BP oil spill was that "the people on the ground who actually had to do the work were having their morale seriously degraded by the reporting in the press on the ineptness . . . or the public grieving that was going on. Whether it was the perception of a lack of responsiveness of the federal government or BP's role, the people who were most critical to solving the problem felt they were just getting hammered in the press every day. Whether you were a rig worker working for BP or a FEMA relief worker, all you heard was your organization getting dumped on, and that has a really, really corrosive effect on morale." "At that point there was a collective sigh that probably would have blown the doors off the place-metaphorically- and then people began to weep, because nobody had told them what was important, what was valued, what their roles should be, and that their boss was behind them," Allen recalled. "In a very simple and direct way, I was able to tell them that." It was a textbook case of a leader taking charge of an organization dangerously spiraling out of control. And in a broader sense, this was a leadership moment for which Allen, like me and like so many others thrown into challenging situations, had been preparing his whole life. Thad Allen, who was born while his father was "underway" in a Coast Guard cutter, was groomed to be a man of action. "I think I'm the only enlisted brat that ever became the commandant," he noted. "That probably gave you a different perspective on the service," I said. "Everybody says to me, 'You must have gone into the Coast Guard because your dad was in the Coast Guard," Allen replied. "And frankly, the reason I went to the Coast Guard Academy is, I thought I was too small to play Division I football. I walked on the varsity in my freshman year and I was a captain my senior year. As a result of all that, I ultimately became the commandant. So I tell everybody, if I'm ever going to write an autobiography, I'm going to call it Accidental Admiral." Like mine, Allen's formative years had been shaped by parents who'd struggled through financial hardships and World War II, so I asked him if he felt a strong obligation to serve his country. "Early on, I went to the academy and my goal was to spend five years, serve my commitment, and get out," he replied. "And frankly, I was a handful early on. I had a bad temper. It was exacerbated by the fact that, in my junior year at the Coast Guard Academy, my older brother died from an overdose of heroin in Tucson, which significantly impacted my dad and almost led me to leave the academy. In fact, I ultimately stayed at the academy because I thought if I left after that, it would just break my dad's heart. That's probably another reason I'm still around and ended up doing what I was doing." Allen came to love the Coast Guard, from its history to its unique Principles of Operation, which include the principle of on-scene initiative, a vital part of his approach to leadership. It means "if you're there, you have the capability, you should do something," he said. "Also, we have the principle of restraint. We are not an overwhelming military force, we deal with our fellow citizens, and you need to treat them with respect when you go on board a boat. "One of the things we are really good at-and this is an 'Allen-ism'-is being bureaucratically multilingual," he added. "We can talk military to military, we can talk incident command system to local fire chief, we partner across the federal agencies, we can work with state and local governments. We are really good at partnering and collaboration." When individuals, departments, or organizations act in isolation without regard to their impact on others, it is known as a silo mentality. I noted that Allen seemed to be a leader who specialized in breaking down silos and organizing a united front when faced with chaos. He agreed, and then mentioned an early experience that helped form his approach to leadership under fire. The "pivotal event" in his Coast Guard career came immediately after his graduation from the Coast Guard Academy, and ironically enough, it was a seminal aviation accident that many of us in the airline industry have used as a teaching example for years, one that eventually caused my profession to change the way we teach cockpit leadership. Eastern Air Lines Flight 401, a wide-body jet flying from New York City, crashed into the Everglades about eighteen miles short of the Miami International Airport runway, on December 29, 1972. One hundred and one people were killed immediately. Two others died of injuries later. Seventy-five people survived, thanks to rescue efforts by air boaters who'd been nearby and the swift arrival of the Coast Guard, including twenty-three-year-old Thad Allen, who was assigned to the Coast Guard air station at Opa-Locka. "I actually ended up getting on the first or second helicopter to arrive on the scene," said Allen. "I was in the wreckage for about twenty-four hours, hauling survivors, bodies, doing whatever needed to be done. There were about six of us who got in, and then they couldn't bring anybody else in, so we were the first ground team that was there. So, yeah, that was a pretty substantial event in my life." Allen said the experience of being involved in a massive rescue operation under such horrific conditions-some rescuers sustained burns from jet fuel burning in the swamp-taught him the value of first responders and clearheaded crisis leadership at a very young age. Exclusive News: This Season The Talk Tells All!